Situated at the crossroads of Europe and Asia, the Rhodope Mountains are a unique ecosystem with a rich biological heritage. For more than 20 years, Stoycho Stoychev has been working to preserve this place that he calls home; the Bulgarian has long been considered a champion for the conservation of local wildlife. Stoycho Stoychev, team leader of the Rhodope Mountains rewilding team in Bulgaria. 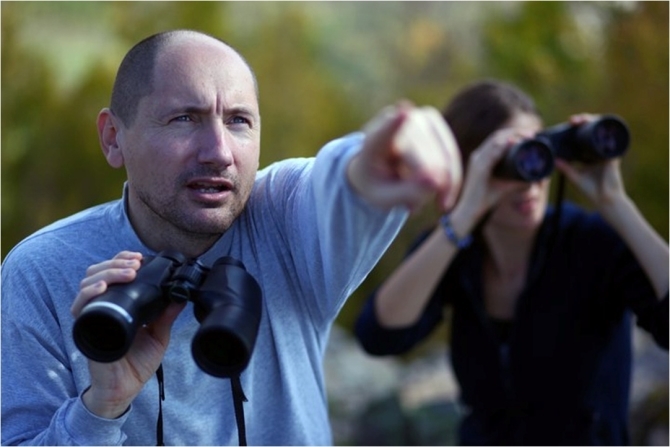 As conservation director for the Bulgarian Society for the Protection of Birds (BSPB) – part of BirdLife International – Stoychev has devoted his life to safeguarding the future of the area’s rare raptor species. The Rhodopes are a crucially important breeding area for locally rare griffon vultures and globally endangered Egyptian vultures, and he has been involved in their conservation since the 1990s. His successful work on the recovery of another iconic species in Bulgaria, the Imperial eagle, brought him the Whitley conservation award in 2014. Eurasian grey wolf at a vulture watching site in the Madzharovo valley, Rhodope Mountains rewilding area, Bulgaria. When Stoychev first learned about rewilding and its underlying philosophy, he saw an opportunity. 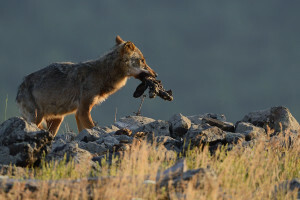 A wilder, self-regulating ecosystem with healthy numbers of animals all along the food chain is of obvious benefit to vultures – bigger populations of wild ungulates mean a larger number of kills by wolves, who in turn leave the carcasses for the birds to scavenge. Excited by this prospect, Stoychev’s team within BSPB, proposed the Rhodopes as a Rewilding Europe initiative – his submission was accepted in 2015. Today Stoychev divides his time between his job at the BSPB and his team leader position at Rewilding Rhodopes. Both organisations are working collaboratively on an EU-funded LIFE Vultures project to support vultures through groundbreaking initiatives such as the recovery of red and fallow deer populations and supporting nature-based tourism. While these charismatic birds may not be particularly loved by the general public, they are the star attraction for birdwatchers and wildlife photographers. 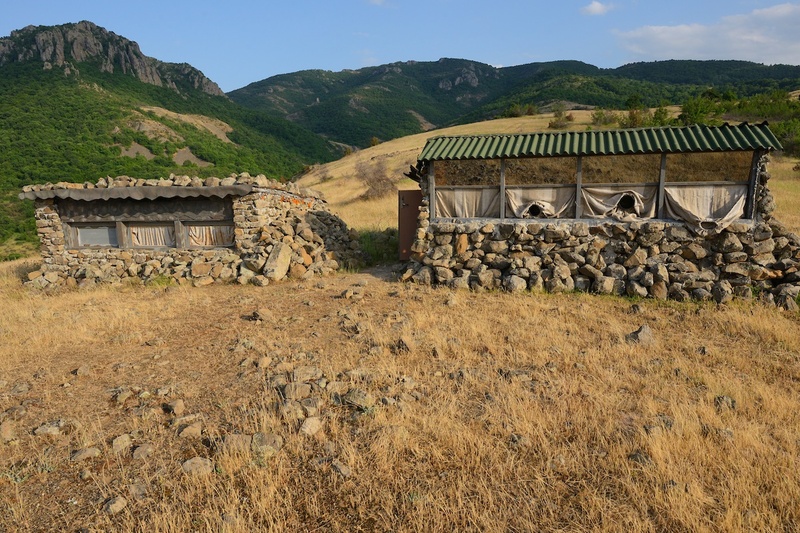 As a result, they are of demonstrable benefit to the local economy, and nature-based tourism providers across the Rhodope Mountains now see them as an asset worth protecting. Vultures are the star attraction for birdwatchers and wildlife photographers in Madzharovo, benefiting the local economy, and nature-based tourism providers. Stoychev stresses the importance of such flagship species for rewilding. To truly capture people’s attention, he argues, wild landscapes need to be promoted as unique and beautiful habitats for charismatic species. In some instances, however, this can lead to friction, particularly when carnivores are the centre of attention. Wolves, for example, are not always viewed favourably by those who fear for the safety of their livestock. But the Bulgarian is keen to point out that acts of deliberate poaching and poisoning are rare. He sees the increasing population of griffon vultures in the Rhodopes area as a particularly encouraging sign, as this implies healthy populations of wildlife all along the food chain, including wolves. This is not to say that his job is without challenges. 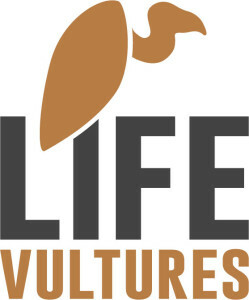 Poisoning still exists and the LIFEVultures project formed the first anti-poisoning unit with a dog trained to find poisonous baits and dead animals. The illegal harvesting of land tortoises, another of the area’s iconic species, is a big problem in some communities. Getting people to rethink such culturally ingrained practices is an ongoing struggle for Stoychev, and something that will likely take years to change. Despite this, Stoychev is overwhelmingly optimistic about the future. Plans to connect isolated populations of wildlife, support the population growth of griffon vultures, attract black vultures from neighbouring Greece, and increase protection of the area’s invaluable old-growth forests, are already in place, while others will surely follow. Thanks, in part, to this hardworking Bulgarian’s efforts, the rewilding of the Rhodopes is well underway – the region’s wildlife and its human residents will surely benefit as a result.